We are going to see how to capture pictures of the screen of a Samsung Galaxy smart phone running either the original Android operating system or the CyanogenMod replacement. It's very quick and simple to capture a screenshot. You can then easily transfer the images to your Linux or BSD computer. 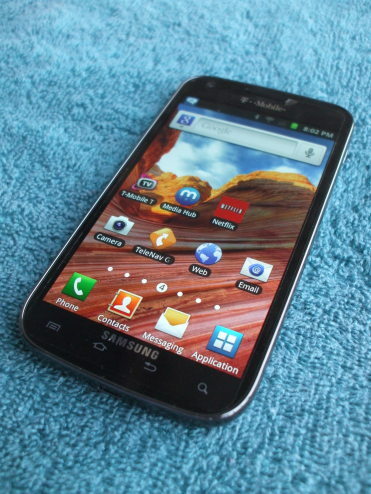 You can view or download the manual for the Samsung Galaxy S2 here. It's a sizeable manual: 273 pages in an 11.0 MB file. However, it does not explain how to capture a screen shot. Android 4. *, also called "Ice Cream Sandwich"
Android 2. 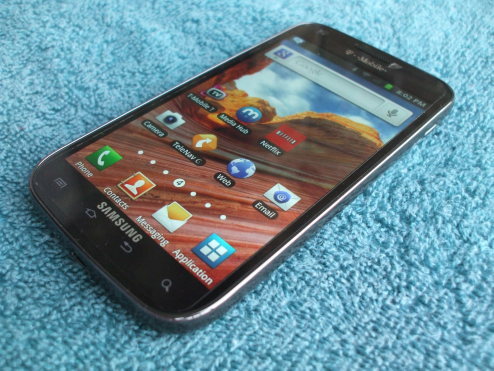 *, also called "Gingerbread"
Press and hold the Home button, and simultaneously press the Power button. Home is the 2nd button at the bottom of the display, and Power is near the top of the right side, just barely visible in the picture at right. Release the buttons to save the screen capture. Android 4.0.0 — 4.0.3: Press and hold the Volume Down and Power buttons simultaneously. You must keep them held down for one to two seconds. Android 4.0.4: Press and hold the Home and Power buttons simultaneously. You must keep them held down for one to two seconds. The screen capture is saved as a 480x800 pixel PNG image file. The file name is built as SCYYYYMMDD-HHMMSS.png. That is, if the current time and date is 14:56:46	on Sun, Apr 21, 2019,	then the screen shot file will be stored as SC20190421-145646.png in the folder /ScreenCapture. The file name is built as Screenshot_YYYY-MM-DD-HH-MM-SS.png. That is, if the current time and date is 14:56:46	on Sun, Apr 21, 2019,	then the screen shot file will be stored as Screenshot_2019-04-21-14-56-46.png in the folder /storage/sdcard0/Pictures/Screenshots. Next, see this page to see how to connect your phone to a computer and copy or move the image files to the computer's file system.